The Jesse Bradley house at 54 Wright Street is an Italianate-style colonial. WESTPORT — The streets of Westport serve as an important public record. Like the pages of a history book, they mark the passage of time, document changing architectural tastes, and shed light on residents’ lifestyles through the centuries. In some neighborhoods, modest vintage farmhouses stand beside enormous newly constructed colonial houses. In others, the antique colonials built in centuries past are expanded to match in size and offerings more contemporary dwelling places. Sadly, many were erased from the landscape to make way for new construction. An enterprising group of real estate agents from various agencies have joined forces to hold a unique marketing event that showcases a dozen houses among Westport’s historic inventory. 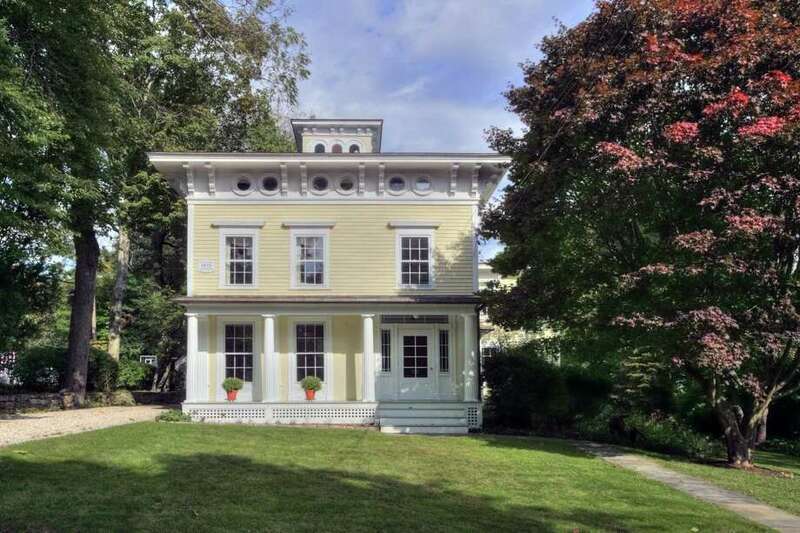 The Realtors will host a public open house at 12 antique homes on Dec. 2 from 1 to 4 p.m. They span two and a half centuries; the earliest was built in 1770 and the most recent was constructed in 1910. One, at 60 Long Lots Road, bears the name of its early owner. The Daniel Burr House was built circa 1770 and, according to its plaque, the Greens Farms Society met there in 1779-1780. The house at 326 Wilton Road was built in 1880 and, as with all of these houses, enjoys “old time charm and modern amenities.” Special about the property on which this house sits is its explosion of color each spring from the more than 700 tulip bulbs, about 300 of which were planted outside the fence allowing passing motorists to take in the beautiful sight. In the Kings Highway North Historic District, an elegant Italianate colonial sits on a three-quarters of an acre parcel. The Jesse Bradley House, built circa 1840, shares its grounds with a natural-colored antique barn. The Goodsell Barn at 161 Sturges Highway was originally built in the 1800s and was converted into a house in 1920. The Louis Partrick Homestead at 87 Partrick Road is a farmhouse built in 1823 and has a companion 1850s barn. Inside there is a fireplace with a beehive oven. Wigren said people are drawn to vintage properties for a variety of reasons. “There is craftsmanship and solidity of materials that are difficult, if not impossible to find, nowadays. There’s a sense of being part of something that’s bigger than yourself, on-going history that looks backward but in a sense also looks forward. You are a part of it by joining the parade of owners of a particular place,” he said. He said owners of historic or vintage homes can enjoy the excitement of finding out the story behind the structure. “It makes history come alive on a personal level; a ‘George Washington slept here,’ kind of thing,” he said. What they did, how they lived, how they made their living, how the fortunes of the family may have changed over time. “History is not a point. It’s flowing, it’s ongoing, it continues,” he said. Melanie Marks, founder and principal researcher of Connecticut House Histories, has purchased and lived in three historic homes and values their contribution to the physical, historic and architectural landscape. Marks established Connecticut House Histories to help homeowners uncover the fascinating stories of their houses. “Having watched so many historic houses fall by the hands of a wrecking ball, it saddens me to see their history fall with them. Many people see these old houses as a virtual ‘money pit’ but to those of us preservation-minded, they are truly diamonds in the rough. One only needs to have a vision of what they once were and what they could be. Their charm, their history, their architecture — these are all of the things that make them beg to be save,” Marks said. Vintage houses do require more work than newer construction, but Marks said they are well worth the effort. “To know that you are saving a piece of history for future generations is well worth its weight in gold. Once these houses are gone, they are gone — you cannot bring them back — nor their history. I’ve had three and I’ve loved every one of them for different reasons,” she said. On a practical level, there are benefits to owning an antique home. It’s possible to get tax credits for preserving old houses. Additionally, Wigren said there is a sustainability aspect as well. “You’re recycling,” he said. In Westport, the Historic District Commission is a great resource. “The mandate of the Historic District Commission (HDC), as enabled by both the Connecticut General Statutes and the National Park Service, is to preserve and wherever possible enhance the historic and architectural character of the town’s historic resources, whether or not those resources are a designated local Historic District or History Property,” according to the HDC website.